We’d love your help. Let us know what’s wrong with this preview of Message Remix by Eugene H. Peterson. This isn't your typical devotional. 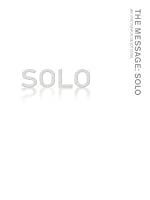 The Message SOLO revolves around lectio divina, or "divine reading," an ancient approach to exploring Scripture updated for today's students. Includes a topical index and numbered devotions. To ask other readers questions about Message Remix, please sign up. Great new quite time material. I like Gene Peterson's provocative techniques of getting you out of your comfort zone and making you look at our relationship with God with a fresh new prospective. He takes you through exerts of the bible from Genesis to Revelation. The only thing I don't like is that he takes you through in a sequential order. I prefer to intermix new and old testament reading as I go. I was interested in the lectio divina practice before I knew about this book, and it was helpful to have a flexible guide as I work out what this looks like practically. I like that there are passages for every book in the Bible (even Leviticus! ), as many devotionals like to skip over the more unpopular books. This guide directed my prayers, journaling, study, and meditation of scripture, even when I wasn't using The Message translation. loved this devotional for the fact it was totally focused on reading Gods word and responding to it through prayer and action. I didnt usually use The Message translation of the texts provided, very occasionally the devotional topic didnt seem to match the original passage, this however maybe 5 times in the entire book. I dont know if I would have any further criticism.Would whole heartedly recommend! I am new to reading The Message, so instead of buying the Message, i bought this devo book- 365 devos through all the books of the Message Bible. based on the "lectio devina" (holy reading) way of meditating- good stuff, forces you to slow down and let the passage breathe into you, but the depth is a tad lacking. (I think its for younger folks...ha.) Still good though for quick ref. Great Devotional to help guide you in quiet times. It takes you through key passages in the Bible that you read, think, pray, and live out. SOLO also has an expanded passage that you can read to get more of the context for the passage. The only draw back for me is that I don't want to only be reading for the Message version. So I read the expanded passage in either the NIV or ESV. Good stuff! Extremely helpful introduction to the spiritual discipline of contemplative scripture reading and prayer, Lectio Divina. The Message bible passages are helpful with fresh and understandable language. Inspiring and spiritually useful. This is the new daily devotional incorporating The Message from Eugene Peterson. It is phenominal! For all of you who are Message fans, Rob Bell fans, Brennan Manning fans...you'll love this one! It's awesome and very short, realistic chapters and applications! Enjoy! This is the best devotional I have ever encountered. I appreciated the use of Ignatio as a way to engage with scripture and I liked the flexibility created by the absence of dates. One of the best devotional books I have ever read. Using it as an ongoing bible study with friends. Easily accessible and includes thought provoking questions with each passage of scripture. Loved this version of the Bible! Peterson is a great teacher and writer, who has done the Christian world a favor in this translation. First devotional I ever finished. Sparked my hunger for God's word, and created my habit of reading God's word everyday. Anything that helps me get into scripture is worth reading and reviewing. However I was expecting a little more from this devotional. I love this book! This is a really helpful devotional, all laid out in the lectio divina format. I appreciate Peterson's paraphrase of the Bible in modern language. One of my favorite daily study guides, particularly for it's simple structure. Great for students, also. I have both the "entire" Bible as well as New Testament version.